Robert Fagles, winner of the PEN/Ralph Manheim Medal for Translation and a 1996 Academy Award in Literature from the American Academy of Arts and Letters presents us with Homer's best-loved and most accessible poem in a stunning new modern-verse translation. "Sing to me of the man, Muse, the man of twists and turns driven time and again off course, once he had plundered the hallowed heights of Troy." So begins Robert Fagles' magnificent translation of the "Odyssey," which Jasper Griffin in The New York Times Review of Books hails as "a distinguished achievement." 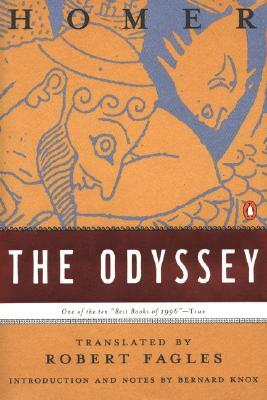 If the "Iliad" is the world's greatest war epic, the "Odyssey" is literature's grandest evocation of everyman's journey through life. Odysseus' reliance on his wit and wiliness for survival in his encounters with divine and natural forces, during his ten-year voyage home to Ithaca after the Trojan War, is at once the timeless human story and an individual test of moral endurance. In the myths and legends that are retold here, Fagles has captured the energy and poetry of Homer's original in a bold, contemporary idiom, and given us an "Odyssey" to read aloud, to savor, and to treasure for its sheer lyrical mastery. Renowned classicist Bernard Knox's superb Introduction and textual commentary provide new insights and background information for the general reader and scholar alike, intensifying the strength of Fagles' translation. This is an "Odyssey" to delight both the classicist and the public at large, and to captivate a new generation of Homer's students. @IthacaStateOfMind Uh oh. This cave is a giant's lair. He has a taste for cheese, and my companions. He also has only one eye. Trying to keep from laughing. Got him drunk. Put a hot poker in his ONE EYE when he blacked out. That will show him - if he could see. LOL. Time to leave. Damn. Poseidon pissed. How was I supposed to know One-Eye was his son? What Olympian whore did he sleep with to get an issue like that?